Photo courtesy of Dying Regime. Used by permission. On January 4, 2016, actress Susan Sarandon shared on the program “The View” about her experience with Syrian refugees in Greece. She described their plight, and ended her talk with this question: “Down the line, we’re going to look at this crisis and we’re going to say ‘where were we? '” You can find it here. Now, let’s imagine… they are Black… and they have one little problem: Most of them, though not all, actually are infected with the Ebola virus! What are we going to do now? Should we turn our backs on them and keep them out? A huge and often controversial debate ensues, especially when so many are politicizing what should be a simple matter of humanitarian intervention. We are debating the matter while those refugees are suffering. How compassionate is that?! To borrow Susan Sarandon’s phrase, “This is not who we are!” – Or would she actually say those words now that we are talking about Ebola? Except, over half the nation just can’t reconcile itself to the idea of having thousands upon thousands of Ebola bombs landing on our shores. Actually, extremism and terrorism – terrible as they may be – are not what I am comparing to Ebola. I am saying that human beings whose minds and hearts are ruled by a political conviction that our present Constitution and democratic values must imperatively be replaced by their own, no matter what, and at any cost, are as dangerous to us politically as an Ebola patient is to our communities medically. Note that I did not say “religious conviction.” So dear reader, don’t try to take me down the path of religious bigotry. Especially, please don’t pepper me with “Islamophobia” yak-yak! Please keep in mind that I am a former Muslim and I do not hate Muslims. And I am not “a self-hating former Muslim” analogous to the proverbial “self-hating Jew,” as has been suggested by some. I am not saying or even suggesting that Muslims, as persons, are the same thing as a destructive virus. I am not speaking of religion or jihad. I am speaking of politics, and I am pointing out a huge blind spot in the Western world’s understanding of what Islam really is. It is not just a religion. It is a political entity. The fact that it is married to religion hides its political side. In reality, Islam is the biggest political party in the entire world. As a political party, it intends to do away with everything you know of democracy and constitutional freedoms dear to Americans and other Western nations. The members of this political party call themselves “Muslims,” which blurs the lines, because we hear that only as a religious label, and we dread being accused of bigotry. To make prayer for political leaders a priority so that peace, godliness, and holiness may prevail (1 Timothy 2:1-2). To submit to governmental authority, not war against it (Romans 13:1-7 and 1 Peter 2:12-17). To resist government-imposed immorality, not subvert the government. This resistance assumes suffering for doing what is right, without inflicting suffering on government officers or any retaliation or subversive political actions (Acts chapter 4 and 1 Peter 2:19-23). Therefore, Christian refugees from the Middle East do not pose a political threat to the West, whereas Muslim refugees might pose such a threat. Christian politics (if one can argue that there is such a thing, as the Church is generally apolitical) would have to be completely different from Islam as a political entity. “Progressive” liberals do not want to reflect on the political ambitions of Islam. They commend themselves for (and often brag about) their focus on the humanitarian crisis that the refugees represent. Of course, as I have tried to argue with the Ebola analogy, they might think differently if those whom they wish to help are the hosts of something deadly for their nation – something other than a religious issue. 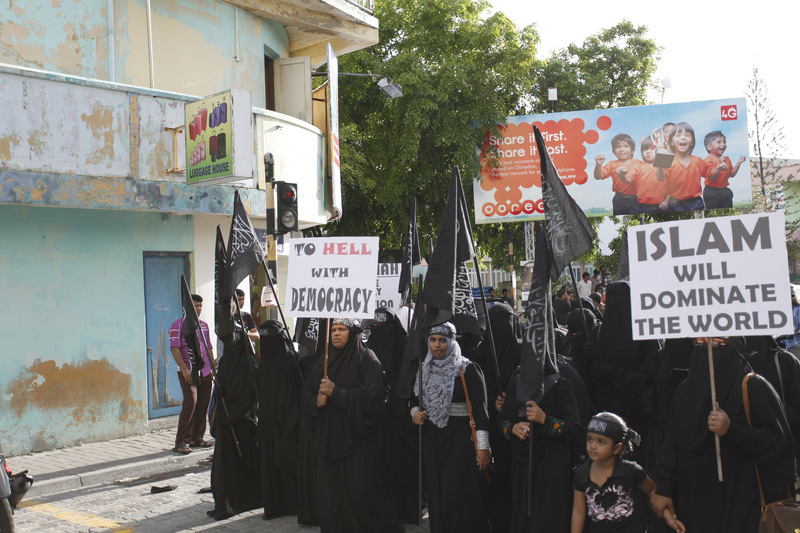 Here is “an inconvenient truth”: The politics of Islam are worse than the Ebola virus. Ebola patients respond to treatment – so we can deal with that. But Islam as politics resists (extremely well) all our proposed Western cures. What is sad is that most Muslims don’t know how terribly infected they are by the Islamic political virus. A Muslim may be a legitimate refugee, and his/her plight may deeply touch our souls, but most such persons have something in them that threatens our very way of life. No, I am NOT talking about terrorism, although that is of great concern. The greater concern is that most refugees want to come here with their political virus, and we don’t see it not only because we are looking primarily at “religion,” but also because we are vetting for the wrong thing. The greater threat is Islamization – not the religious kind, but the political one. I am not as concerned with Islamic religious proselytism. Their desire to see the whole world worship Allah according to the Qur’anic teaching is as understandable as the desire of Christians to see people of every nation, tribe, and tongue trusting Jesus as Savior and Lord. I cherish the religious freedom that America affords to all religious groups. But I am most definitely concerned with any religiously labeled political entity that wants to do away with the very freedom for which American and Western democracies stand. We have historically outlawed and resisted infiltration by political parties that are subversive. We have fought wars to keep at bay those whose political convictions demand the death of our democracy, our Constitution, our rights, and our freedoms. It is with this same sense of danger (which is deeper and more sobering than fear) and urgency that we need to look at the Muslim refugee situation. If we would not take in an Ebola patient without first addressing his fundamental problem, then why would we act differently with a Muslim’s political stance—a stance that truly means every syllable and letter in the cry, “Death to America”? Please note that a little earlier I said “MOST Muslims.” There are Muslims who have NOT bought into the idea that the world should be run by Shari ’a Law or the notion of an Islamic Caliphate in modern times, let alone that the U.S.A. should become part of it. They are loyal to a strictly religious Islam, and they hope that its religious values would influence Western politics, not wage war against them or seek to replace them. There are many such Muslims among the Middle-Eastern refugees – in fact, their re-invention of Islam as non-political is somewhat heretical and could only encourage them to seek refuge away from an increasingly Caliphate-owned region of the world. In terms of my analogy, these are “Ebola-free” and should be helped. But how? In the same way we proceeded with people coming to us from Ebola zones – with rigorous checks, scrupulous triage, THERE, before they ever board a plane! We need to develop a battery of tests that check the Muslim asylum seekers’ ideological temperature, their political inclinations, their willingness to assimilate democratic notions of rights and freedoms that are alien to Islam, their willingness to be relocated to a country that has Shari ‘a Law, etc. Concerning the latter, if an asylum seeker is hypothetically offered help to relocate in a country that has Shari ‘a Law, and if in the course of interviewing and testing we discover that this applicant is willing to go there, this would be a clear indication that this Muslim should never be given refuge in a Western nation. Belief in government by Shari ‘a Law is not just a religious belief. It is a political one. That person should be taken off the list of helpable refugees. Obviously, we need to vet differently. First of all, presently, we are vetting for only one thing—links to extremism and terrorist groups. Without neglecting this aspect of it, what we really need to vet for is political inclination. We need to take seriously the existing laws on our books, namely, the revisions to the laws relating to immigration, naturalization and nationality for the United States made by The Immigration and Nationality Act passed June 27, 1952. Muslim refugees should be vetted on a political basis according to the criteria stated at the end of Chapter 2, Section 212 of that Act, which prohibits granting entry in to the US if a person belongs to or supports “an organization seeking to overthrow the government of the United States by force, violence or by other unconstitutional means.” The present vetting process focuses on terms such as “force” and “violence” and falls short of the directive to screen for any “other unconstitutional means.” We have to do more than look for terrorists. We have to vet Muslim asylum seekers on the basis of their political views and whether such views include support for efforts to replace the U.S. Constitution by Shari ‘a Law. Third, because there is always a possibility that someone falls between the cracks – just as it was in situations of pre-travel Ebola screenings – Muslim refugees admitted to a Western country should be “quarantined.” I am not talking about geographical or physical restrictions. I am talking about “quarantine” as a principle of thorough observation. This means the vetting process continues in another form. This means a long period of observation – three years as a minimum, because you cannot get an accurate reading of the degree of the Muslim refugee’s assimilation into the host country in six months or a year (in Deuteronomy 23:7-8, God insisted on a waiting period of three full generations before the children of aliens could obtain full citizenship in Israel – this should tell us something). The “quarantine” principle means establishing a Justice Department database (to register and monitor, not blacklist and harass) that is constantly updated. It means mutually agreed surveillance for a period of three years. If a Muslim refugee refuses such surveillance, then he/she should go live elsewhere. Fourth, a written contract should be established between the Muslim refugee and the Western government that receives him/her. This contract stipulates that the slightest interest in politically subverting the host country’s democratic institutions and/or its Constitution would mean immediate deportation of that individual to his/her country of origin. In the USA, an American who contributes in any way toward the overthrow of the government will incur severe punishment. There is nothing politically or judicially incorrect in holding a Muslim equally accountable for promoting or acting on political views that are intent on the political subversion of America (Leviticus 24:23). Too complicated, you might say. Not economically feasible, not politically practical, and certainly not politically correct. And I am sure there are folks ready to shoot a thousand holes into my little idea and accuse me of bigotry of every imaginable kind. Even Evangelicals will take me to task (as always in an increasingly morally compromised American church scene who is buying wholesale into false ideas about faith, the Bible, evolution, genetically-justified homosexuality, and about immigration, and many other controversial issues – hence I expect Deuteronomy 28:43 to become a reality). David your thoughts are so accurate & enlightening.This is the best argument to advance & stop the islamisation of any western country. The following extract is on the same songsheet as you I believe. Whenever there is Islamic violence the media uses the word “terror” not jihad. The problem is that the jihad of murder is only one of the four jihads and it is the least of jihads. The jihad of murder will kill people, but the jihad of money, speech and writing brings us closer to Sharia. Sharia annihilates a civilization. Civilizational jihad is found in the content of our new textbooks which praise Islam as the greatest of civilizations. These new textbooks are filled with half truths, which cannot be challenged. The jihad of textbooks will destroy the thinking of a generation. The jihad of money has invaded our universities which reject critical thought about Islam in exchange for donations from the Saudis. The Islamisation of universities is far worse than murder. Another jihad that is killing us is found in religious dialogues. The idea sounds wonderful, but the ignorant Jews and Christians just smile and nod their heads as they agree that Islam is so wonderful. Debate is absent by consent. And another nail is driven into the coffin of our civilization. You have opened my eyes to several points in your article. Stunned in regards to Deuteronomy 23! I simply have not seen that verse ever. Love you and your ideas. Your position is not sensible. Nor does it accord with your own analogy of likening it to Ebola. There is such a thing as latent Ebola. Even if the person were to pass all your test, the fact is, they still subscribe to Islam. Later they might become more devout, and think the need to kill unbelievers where ever they find them, and fight to impose Islam ( through Jihad ). Or, the their children, of the second and third generations might. And if experience is any guide, this is even more likely. The fact is, if they still believe in Islam, they are still carriers. Very insightful writing.Is it ok if I copy and paste this to my women’s group page.